What is your point of inflexion? How do you choose to act on? What is your point of inflexion? How do you choose to act on to be one or the other? Is it the opportunity? For many people to decision to choose to be good or bad (right or wrong) is influenced by opportunity, ambition, greed or desperation. As I mentioned in my previous post When opportunity knocks the door….values often shut blind. I argued that for most , the decision to stay on one or other side is directly influenced by external factors and opportunity at the top of the list. Opportunity presents itself in two forms: time and price. Is it the price? : Price is arguably drives most decisions. So some times people don't want to pay the price to stay on right and look for opportunity to avoid it even though they might cross the line on the way. Software and music piracy are prime examples. Is it the time? : Convenience or time is another driving factor that influence our decisions either way. If it takes 6 months to process the right way and it only takes a month to go the wrong way, some may choose the wrong way. or is it the pain or joy associated with choosing a way? When opportunity knocks the door....values often shut blind. Read a thought provoking post on Seth's Blog about the tacit honor system in our society, the notion of 99% of people are good and only 1% of the people are actually bad. So if you treat everybody as if they belong to that 1%, you might loose the 99%. Just about everything in civilization works on the honor system. No armed guards at the local grocery store, no pat down as you leave the library. Most people cross the street without fear of crazed hit and run assassins. Great marketers are able to deliver customer service because they're willing to give people the benefit of the doubt. They tend to take your word for it. Of course there are bad actors. One out of a thousand people will cheat on that test or rip off that store. When LL Bean or Patagonia offers a no-questions-asked money-back guarantee, some jerks decide to buy an outfit, go on a trip and then return it all. If you spend all your time worrying about these folks, you end up underserving the other 99% of the population. Take the write off. That's what successful marketers do. Though I agree to an extent to the notion of 99% on one side and the other 1% on the other side of any such argument, I believe that there is a great portion of that 99% actually will jump to the otherside when there is an opportunity or necessity. Very few people will always stand up to their values. And very few people will always be bad no matter what you do. Whatever we do, people on either extreme might not change a bit. But they represent a very small portion of any system. So to establish an honor society it is very important to install additional checks which will keep this 'great portion' of cats-on-the-wall in check. Atleast, create an illusion that there is such a system watching them. An intersection with cameras (though not-working) will keep most drivers in check. Closed circuit monitors in shops keep most of those itching hands safe in pockets. Regular audits by IRS keep a majority of people report exactly what they earn. When nobody is watching, almost everybody act strange. The code of honor rely on the security checks installed on the system. Have an optimal level of those checks and monitoring systems and have a good insurance to cover the 1% bad guys. Let them enter through the door heads high by closing down the windows. Seth Godin on 'How to make a million' says tyring to make a penny from hundred million almost never works. Instead try to make a dollar from million people. It almost never works because the challenge of reaching that many people is just too great. It's too risky and too expensive. Doesn't matter that you're only hoping for a dollar or a penny. The price isn't the challenge, it's the difficulty in spreading your idea. Far easier to make a thousand dollars from each of a thousand people, or even $10,000 from a hundred organizations. You can focus on a small hive of people, a group that talks to itself. You can push through a smaller dip and reach a level of recommendation and dominance that makes incremental sales far easier. And you can learn much earlier in the process if you've gotten it right or not. Because you're making more per sale, you can spend the time necessary to figure out what really sells and modify your offering sooner in the process. The irony is that many products and services that have reached huge masses of people actually have significant margins (Windows, for example, or a cup of Starbucks). They got the best of both worlds because first they focused on winning small communities over and that led to the larger market. Apply this rule to today's web2.0 companies and software development companies. I don't understand where they are going. For most web2.0 companies, the only revenue channel is by showing ads. To make any marginal revenue out of those ads, you must server Millions of page views. Each page view paying a penny. And software companies like 37Signals does it entirely different. They only had around a Million customers. Not sure how many of them are paid customers, but they charge a minimum of 12 dollars a month for a paid customer. To generate 12 dollars in ad revenue if we go the ad route, they need a minimum of 20,000 page views. So when it comes to listening to customers and make changes in thier products, which organization is better. In other words, if you want the organization to respond to you, you know which one to pick. Many companies used to sell their software by licensing it for a fixed number of servers or users or a combination. (Take for example Solaris Unix). And then they decided to offer the software for free. Motivation behind is to get more customers who pay $100 per support instead of having few customers who pay license costs that runs in thousands per license. So finally, which one is better. Offer your product free and sell ads. Millions of signed up users to boast while you may not be making any profit. Or offer your service at a fee. You have only a few customers but you may make Millions in profits. Is the internet killing our culture? 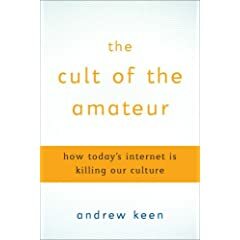 Another book on the block that is vehemently complaining about internet and its ill effects on Culture. I remember an earlier discussion about Wikipedia, complaining about its amateurish mob made content compared to so called validated and trusted expert content from famous encyclopedias. Whether there is any truth in that matter or not, first website I and most of my friends and collegues refer to when in doubt is undoubtedly wikipedia. On subjects we knew in depth, we compared the quality of content and found no truth in those allegations. Another word for narcissism is “personalization.” Web 2.0 technology personalizes culture so that it reflects ourselves rather than the world around us. Blogs personalize media content so that all we read are our own thoughts. Online stores personalize our preferences, thus feeding back to us our own taste. Google personalizes searches so that all we see are advertisements for products and services we already use. In the Web 2.0 world, however, the nightmare is not the scarcity, but the over-abundance of authors. Since everyone will use digital media to express themselves, the only decisive act will be to not mark the paper. Not writing as rebellion sounds bizarre—like a piece of fiction authored by Franz Kafka. But one of the unintended consequences of the Web 2.0 future may well be that everyone is an author, while there is no longer any audience. The content on youtube and flickr may be naive and amateurish. But it is original, fresh and so refreshing. They are lot better than boring and stereotyped TV shows and reality crap. I agree that the more we personalize and customize we read only what we like and might miss a different perspective. But we do this kind of personalization all the time, even without web2.0. Not everybody read every page in a news paper, every page of a magazine or every program aired on 100s of channels. We choose a certain channel, certain program or a certain series. Do you watch every basket ball game that is ever played? You choose your team. You choose your game. Do you listen every music CD that is ever released? Have you ever been to every restaurent that is open in the world? You pick one you like. So personalization is nothing new and internet can not be blamed for that. Regarding everybody becoming an author, in a democractic world every citizen has equal opportunity to become the leader of Nation. Does that mean there will be no leaders and no followers? In most parts of the world, everybody has an equal opportunity to own a business and produce a valuable product or service. Does that mean, there is no consumer and there is no meaning of business? Is it chaging/killing our culture? Yes it is. For sure. But that is the essence of culture. Culture is an evolution of how we live. Not a static representation of a life style. Our culture is how we live, then culture is a post-martem representation of a lifestyle. Not the other way. Internet is changing the way we live, communicate and collaborate. Its a new culture. But an empowering culture. Internet is providing an equal opportunity to everybody to become what they want. And in that aspect, internet is the best thing that has ever happened to the civilization. One that treats everyone equal and provides an equal opportunity. Quite an interesting innovation and very promising for all of us. Whiteboards right on the refrigerator. No more stick-its and post-its on the regrigerator. Go head scribble your thoughts on the refrigerator itself. When GE launched “Imagination at Work” as its new slogan to replace “We Bring Good Things To Life”, the most eye-catching part of its online campaign was a virtual whiteboard that visitors could sketch and scribble on. Apparently, someone at GE had the smarts to transfer the ad’s essence to the gleaming white surfaces of GE’s appliances. White goods + whiteboard…? Witness the birth of the sketch-a-fridge. Currently only available in Brazil, where it is sold as Risque Rabisque (roughly: Scrawl & Scribble), the refrigerator is covered in a special coating similar to dry erase whiteboards. Replacing the age-old practice of sticking grocery lists and children’s drawings on the fridge, missives can now be written directly on the appliance and easily wiped off. It’s a simple innovation that cleverly integrates existing human behaviour, and turns a mundane product into something playful and appealing. Opportunities? When rethinking a product or service, don’t just focus on features or haute design. An element of fun can be just as much of a sales magnet, at a fraction of the cost. Don’t let complexity stop you. Be activists. Take on the big inequities. It will be one of the great experiences of your lives. You graduates are coming of age in an amazing time. As you leave Harvard, you have technology that members of my class never had. You have awareness of global inequity, which we did not have. And with that awareness, you likely also have an informed conscience that will torment you if you abandon these people whose lives you could change with very little effort. You have more than we had; you must start sooner, and carry on longer. Knowing what you know, how could you not? And I hope you will come back here to Harvard 30 years from now and reflect on what you have done with your talent and your energy. I hope you will judge yourselves not on your professional accomplishments alone, but also on how well you have addressed the world’s deepest inequities… on how well you treated people a world away who have nothing in common with you but their humanity. Frustrated with multiple web silo services (about 20 different websites I regularly use and ofcourse I hate to manage 20 different logins and bookmarks), I have started moving to 'All Google' services. With a single sign-on, I can access most services and the most interesting benefit is an excellent integration between different services. And, I really did not know until today that Google has acquired Feedburner. That makes my moving to 'Everything Google' camp little closer than I thought. We are happy to announce that Google has acquired FeedBurner. For more information related to the acquisition, read our FAQ. With feedburner moving to Google camp, all web services I use(except wordpress and central desktop) are now Google services. Google Reader : This is the second mostly used Google application on any given day after search engine. I also dumped my desktop RSS reader in favour of Google Reader. Keyboard navigation is my favorite. Gmail: This is the harder part to leave Yahoo. But Gmail is a lot better than Yahoo Mail. I love the pop access and Gmail on Mobile. iGoogle is lot better that myYahoo. My own search engine powered by Google to search all sites I am interested in. There are still some services I can not get rid of at this point, but pretty soon I will find a replacement. Not sure what happened with Jotspot (acquired by Google). When it is integrated with other Google services, I bet Google will have almost all I want to have on web. Its quite unusual to see a book like this in India. In US, if some one is successful in one venture, then their second venture is to sell that (so called) success formula. He/she spends the rest of their lives in selling that success through books, seminars, merchandise.. any thing that can be sold. I don't believe that if you read those and probably follow them you will succeed. But it is good to see what their success made them to believe in. It is quite unusual to see similar books in India. Don't know why, I don't find (m)any books where Entrepreneurs and successful Indians wanted to share their stories. There are so many untold stories and unsung heroes. One of my friends, who share a similar mysterious belief, sent me a link to this book to prove the point that times are changing. It also has its own website to promote (http://www.ithappened.in/). The book is sold online through futurebazaar.com. But, the website shipping options only allow me to choose an address in India. Wondering how to get a copy of it to US. Searched in Amazon.com but couldn't find it. Sent an email to a contact address on the website and waiting for the reply. Update: Received a reply from Sankarson Banerjee, CEO of futurebazaar.com. If you are interested in getting a copy of the book and you are currently in US, then hurry up. The book will be shipped to your door for Free. He has offered to send a free copy to the first 10 people that request the book from US. Read his comment for more details. A recent report by Kauffman Foundation infers that there is a strong correlation between educational attainment and entrepreneurship. A report released by the Ewing Marion Kauffman Foundation that tracked the educational backgrounds of immigrant entrepreneurs who were key founders of technology and engineering companies from 1995 to 2005 shows a strong correlation between educational attainment (particularly in science, technology, engineering and math) and entrepreneurship. Click image, above, to read Education, Entrepreneurship and Immigration: America's New Immigrant Entrepreneurs, Part II. Click image, above, to read America's New Immigrant Entrepreneurs (part 1 of the study). The report studied only Technology and Engineering companies. It would have given a much better picture of Entrepreneurship if it had included all kinds of Entrepreneurship activity by these immigrants. If the report had shown that educational attainment is a key factor in every Entrepreneurial activity, I would have bought it flat. Most of these Tech-Entrepreneurs (as per report about 93%) came to US for work or study. As everybody already know, this is the primary reason for Indians to come to US. US Immigration is not that easy to tackle, if not impossible, for a highschool dropout to come to US and start a business. If we see Indian immigrant population per se, these numbers will stay the same. Almost all came for either study or work. So I would rule out their educational background in high tech as a factor for their entrepreneurial ventures in US. If they had come to US for 'any other damn reason' , they would have started their own companies. If education attainment is such a key factor for Entrepreneurship, why don't we find similar Entrepreneurship activity in India where the rest (a majority) of the High Tech Indians still work or study. It is the same case with most other Immigrants (from china etc). They all came to US for either work in high tech or study in US. Whatever they do, you will find a strong correlation to their High educational attainment. For example, barring a small portion of these Entrepreneurs, rest of these high tech Immigrants work throughout their lives as employees of some firm. That is a strong correlation between High Educational attainment and mind blowing lifestyle. The % of these Indian Immigrant Entrepreneurs that came from IITs is only a 15% as per the report. That number itself tells a lot more than I can argue. IITs only take the brightest of students. But they represent only 15% of the Entrepreneurial activity, despite all the hype, investment and high action networks. It clearly rules out you don't have to be at IIT to become an entrepreneur. IIT background helped these guys to come to US and work or to study and provide an easy access to lots of resources for sure. Whether their 'belong to IIT' has anything to do with their entrepreneurial spark is still debatable. I believe, your engineering excellence has nothing to do with Entrepreneurship. It is altogether a different mindset. A different perspective of looking at an opportunity and the market. If you say, if you can cook a better burger you can become an Entrepreneur at making burgers and probably beat McDonalds, I would try to believe then that your engineering excellence would make you a better Entrepreneur. And, I will learn my lesson. Isn't there a strong correlation between starting your company in a 'Garage' and its success? Isn't there a strong correlation between 'living on the streets' and becoming 'a rock star'? Isn't there a strong correlation between 'dropping out of high school' to 'building an empire'? To become a successful entrepreneur and start a Technology or Engineering company, do you want to study an MBA? or MS in Computer Sceience? or .... drop out of high school? or ... ?? Correlations are good for reports, books, seminars, yeah, ofcourse blogs and I believe good for nothing. Many Americans tend to assume that every other Indian is a software engineer or a maths graduate or a high tech graduate. And yet 99% of Indian entrepreneurs that actually built India and making a difference to India as you read have unfortunately never studied any of them. Those who studied are mostly working in IT and many of them in US or working for US based IT companies. Why Does The iPhone Not Have 3G On Board?